It's a sad necessity that most of what a museum or gallery owns needs to be kept in storage most of the time. The figure varies across institutions, but items in storage can represent a huge proportion of a collection. The Art Gallery of NSW estimates that only 5% of its collection is on display at any time. ICCROM puts the worldwide figure of objects in storage at 90%. That's a lot of paintings, sculptures and artworks that are packed away! So what does this mean? Frankly, storage areas are the most important part of any collection. They need to be clean, uncluttered and climate controlled, as well as well-managed and well-inventoried. They should be protected from risks such as fire, water, dust, insects and rodents. In a nutshell, museum storage areas are at the forefront of preventive conservation, and their structure, management and use are key to whole-of-collection care. UNESCO's Cultural Heritage Protection Handbook N°5. Handling of Collections in Storage, has a short but ambitious list of requirements for a good storage area. In an ideal situation, storage areas are just for that: storage. Packing and handling should be done in a separate area. Where this isn't possible because of space constraints, care should always be taken to remove all packing materials and any debris from the storage area. The moment you start leaving bits of cardboard and packing noodles around, you're just asking for an influx of bugs to feast on that cornucopia. Keep items off the ground. Avoid 'bridging' – items leaning against shelves, or items on shelves in contact with walls. Isolate cardboard in plastic bags or plastic tubs. A well-managed storage space means that items are easy to find and retrieve: that old saying "a place for everything and everything in its place" is very true here. This helps in many ways. As well as ensuring that every item is safely and securely stored, a well-organised storeroom helps conservators to identify missing items. Importantly, it also makes it easy to conduct quick visual inspections to identify any damage, risks, or other potential problems. But hey, this isn't an ideal world. Galleries operate under a number of constraints – budgetary, time and spatial being the main ones. Storage areas aren't named after important donors (but maybe they should be!) and need to fight for funding alongside sexier big-ticket items like escalators, gallery lighting, and grand entrances. Recognising this, ICCROM and the Canadian Conservation Institute (CCI) have put together a series of pictures on Tumblr – Collection Storage Tips and Tricks – showing innovative ways that conservators have worked to improve their collection storage spaces. Repurposing old grilles, using PVC pipe, cotton string, and mobile wardrobes, these conservators have come up with interesting solutions to space problems. The site is part of RE-ORG: Canada's initiative to help smaller museums to retrofit their existing storage areas. Collection Storage Tips & Tricks. An initiative of ICCROM & the Canadian Conservation Institute (CCI) for RE-ORG International. Most pest issues are introduced to collections - literally carried through the door with new acquisitions, loans and loan returns, packaging and dunnage. Every effort should be made to ensure that incoming material is free from pests. When receiving new objects into storage, always check them for insect activity and treat if necessary. Finally, storage areas are frequently off-site and unstaffed. Although these locations are usually monitored by security, they should also be frequently visited by qualified conservators. There is nothing like a trained pair of eyeballs to make sure your storage area is safe and well. It is, after all, housing the majority of your collection! For more info, take a look at RE-ORG Canada's innovative storage solutions, and see what work the international RE-ORG initiative is doing. 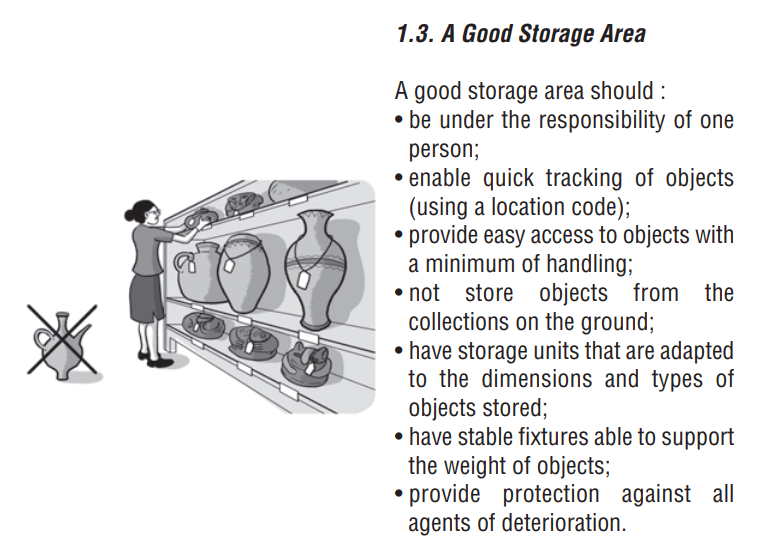 UNESCO's brochure on storage management is here.